Remember those farm nursery songs from your childhood you used to sing? Grab yerself a hay bale, take a swig of root beer, close your eyes, and find yourself transported to toddler's heaven with all the "Quack-Quack-Quacks," "Oink-Oink-Oinks," and "Baa-Baa-Baaaas" you could want. Michelle and Greg get the blue ribbon for putting on the best farm party in the city to celebrate their son, Hunter's, first birthday. Hunter arrived to the party in style, wheeling it in his miniature blue Mustang convertible. Hobby horses, red bandanas, and cowboy hats hung off the fence rails and chairs. The tables were festooned with cowhide print tablecloths. The centerpieces featured farm scenes with animals and a barn, stuck into mini haybales, with "Happy Birthday, Hunter" signs. His birthday cake was decorated to look like an adorable red barn, and the party favors were custom cookies shaped like barns as well. The snack table was farm themed with "chicken feed," "tractor wheels," and "baby apples." Hunter's photo display hung on a rustic wood pallet. They also got a food truck to serve "The Hunter," delicious chicken and waffles served up hot. Did we mention, there was also a live petting zoo set up in the yard with alpacas, goats, ducks, a tortoise, and bunnies!!! Forget Pinterest, all your farm-themed party ideas are right here. 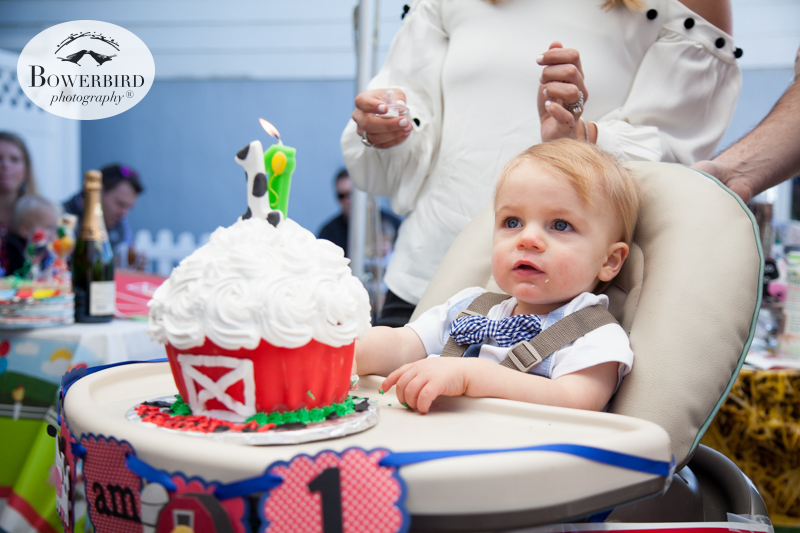 We are so excited to celebrate Hunter's first birthday. The party was fantastic. Friends and family were able to relax and have a darn dootin' good time, grateful to have this great guy in their lives. To many many more wonderful years!